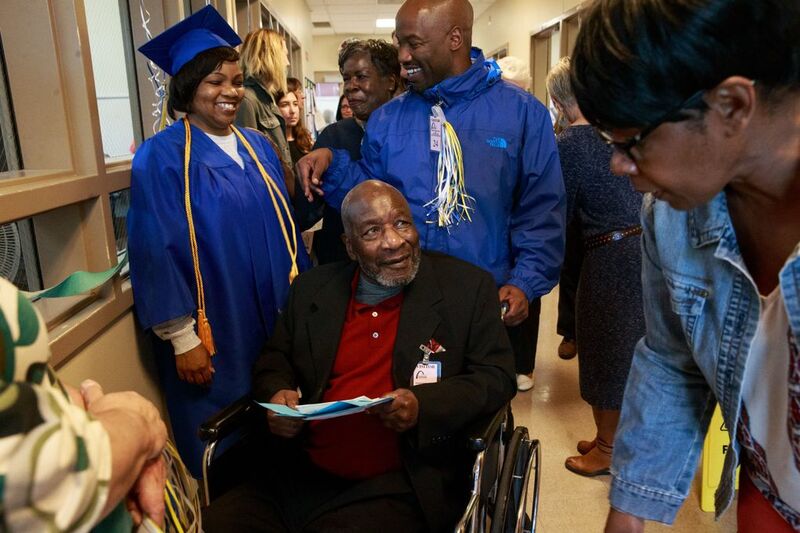 Parents and grandparents, sons and daughters, cousins and friends and other student inmates filled the room, bursting into applause over and over. Laughing, crying and shouting “You go, girl!” again and again. The women in royal blue caps and gowns were all long-term inmates, serving sentences for such crimes as robbery and attempted murder. Twelve will be released in the next five years. Critics of college in prison have long argued that felons should not get a free postsecondary education while serving time. 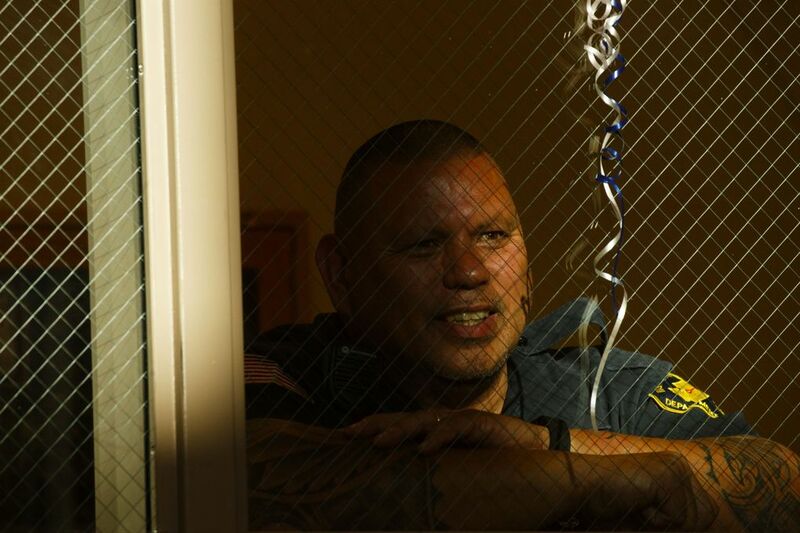 Under Washington state law, taxpayer money can only be used to help offenders earn a high-school diploma. This year, new legislation passed that expanded the offerings to include a business or vocational associate degree. 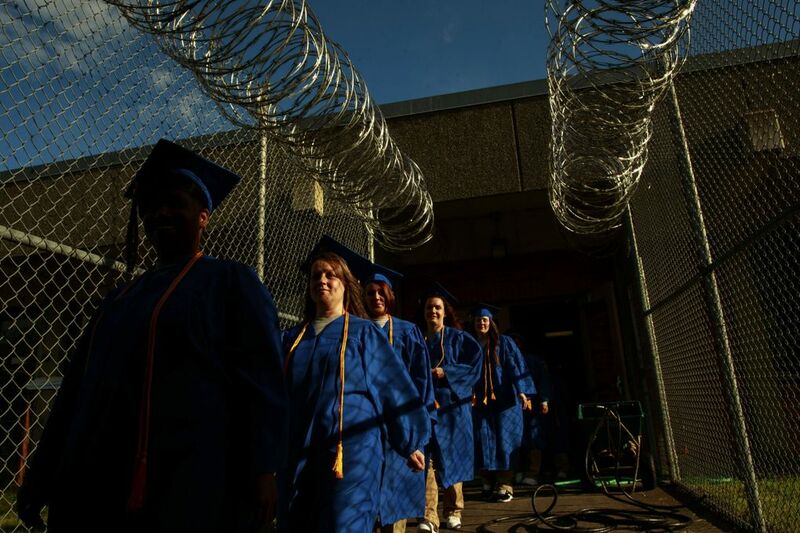 But these women are working on liberal-arts degrees, paid for by a private group that believes a college education makes it less likely inmates will return to crime, and more likely they’ll get a job. 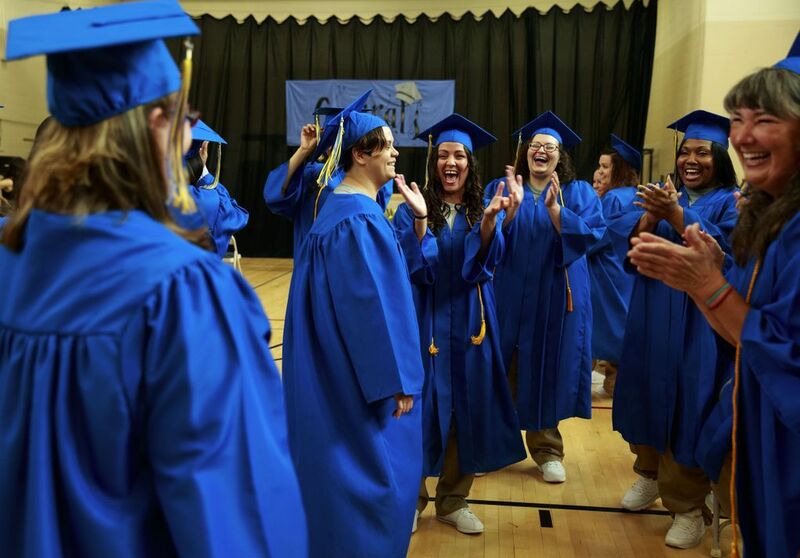 The program is run by Freedom Education Project Puget Sound, a nonprofit that provides an accredited college program to women at the Gig Harbor prison, and helps them continue their educations after they are released. 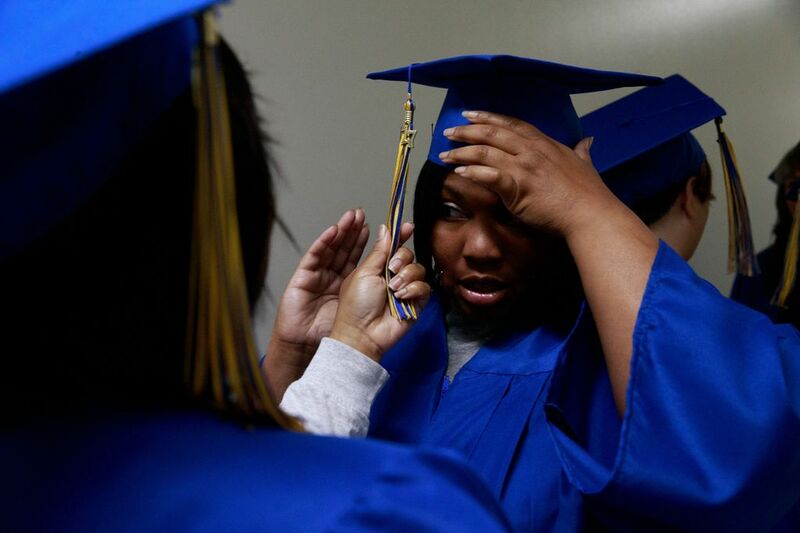 Last year, the five-year-old program — which is offered only at this prison — had four graduates. This year, it was 19. Next year, as many as 30 of the program’s 80 enrolled students are on track to complete a degree. 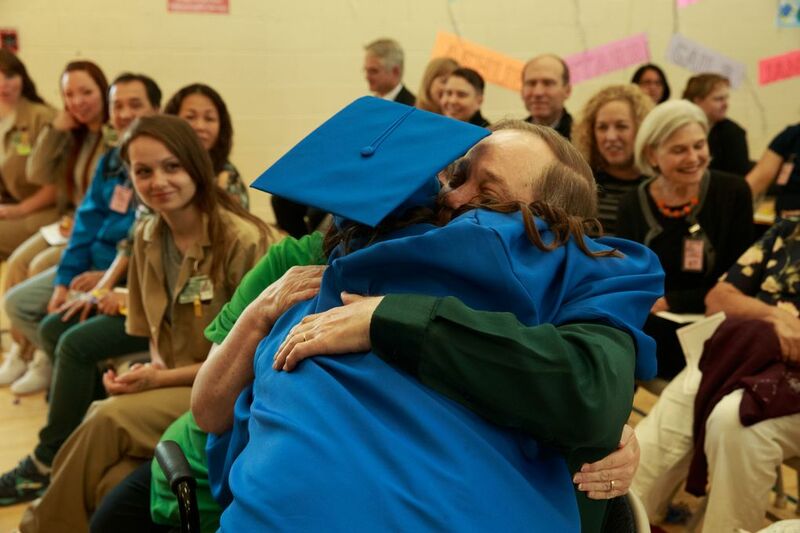 “This is the largest women’s prison graduation I have ever seen, and I am so proud,” said Cheryl Wilkins, the senior program manager at Columbia University’s Center for Justice in New York, who flew across the country to give the keynote speech. Wilkins herself served time at a New York prison for armed robbery and assault, went on to earn a degree in prison, and is now considered a national expert on criminal-justice reform. A 2013 meta-analysis conducted by the RAND Corp. found that education programs in prison do improve the chances that after inmates are released, they will not return to crime, and that it may improve their chances of getting a job. But the study wasn’t able to determine what type of education had the greatest impact — whether it was high-school degrees, vocational offerings or bachelor’s degrees. Of the 900 inmates at the women’s prison in Gig Harbor, only about 80 are currently enrolled in the Freedom Education project. Another 150 are on the waiting list. The project is unable to accommodate them all because the prison is so overcrowded, and classroom space is limited, said Executive Director Tanya Erzen. 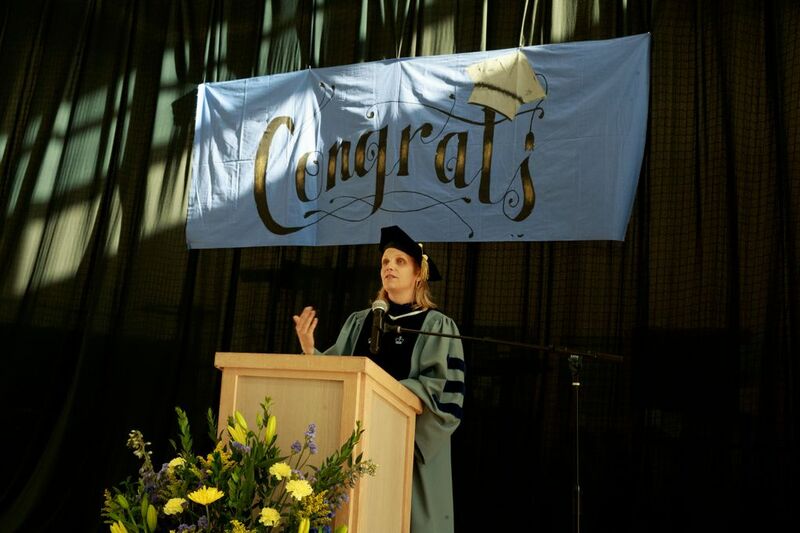 During the graduation ceremony, Erzen spoke about how education was “one of the most powerful ways to disrupt and to change” these women’s lives. The graduates earned associate degrees in arts and sciences, a two-year degree accredited by Tacoma Community College that can help speed their way to a bachelor’s. An associate degree isn’t a ticket to a job, but Erzen said the degree matters because it signals to employers and to other colleges that the graduates were able to do demanding academic work, stick to a timeline and work with other students. Freedom Education pays professors from area colleges and universities a modest stipend to teach at the prison. The classes started in 2011, and the program became a nonprofit in 2012. In 2013, Tacoma Community College agreed to give credit for classes and provide transcripts. 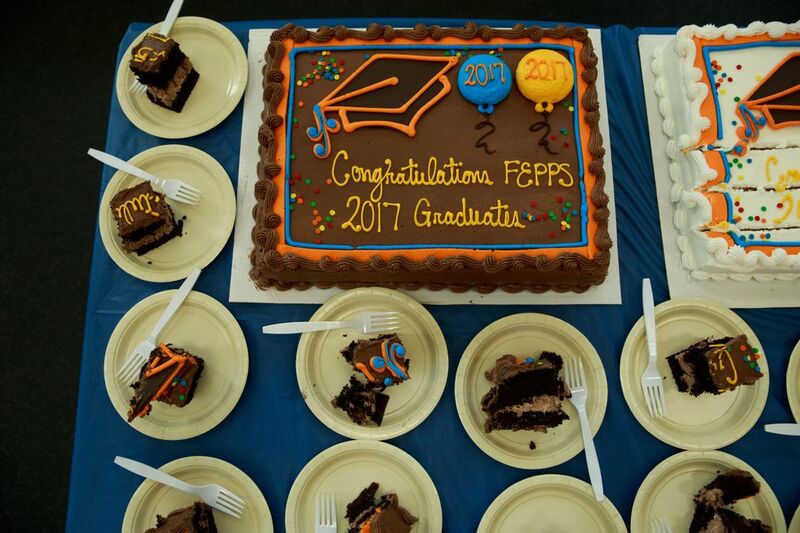 Prospective students must apply for the program, and Freedom Education staff pick prisoners who are serving longer sentences because they’ll have more time to complete a degree. 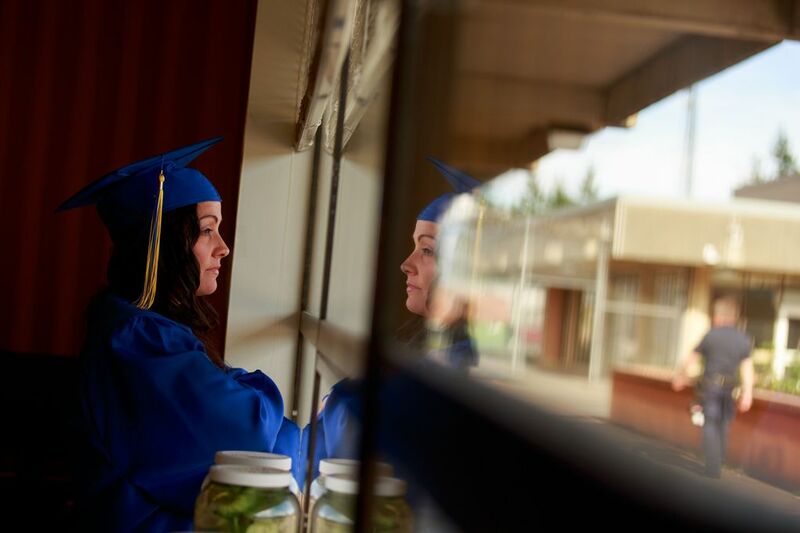 Tonya Wilson, who is in prison for attempted first-degree murder after she served as an accomplice and driver during a gang shooting in Tacoma, helped lead the call for the courses to count as college credit. Last week, she stood before the class as its valedictorian, graduating with high honors, and talked to her fellow students about how the degrees they had just earned had the power to transform their lives. Before the Freedom Education Project arrived, she said, women in this prison earned marks of distinction among the prison population for bad behavior. “And now they have marks for being in classes that challenge you,” she said. 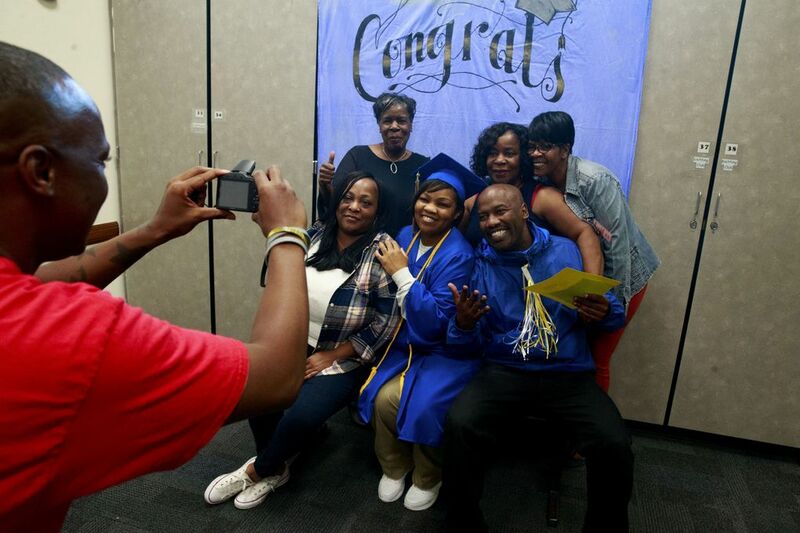 Six of Wilson’s family members came to the prison to watch her graduate: three aunts, one sister, a cousin and her 84-year-old grandfather. “It’s so nice to have people who have been with me for so long and have had sustained faith in me, when I didn’t necessarily have it in myself,” she said. She will be released next year and wants to become a teacher, but she knows that’s a longshot. 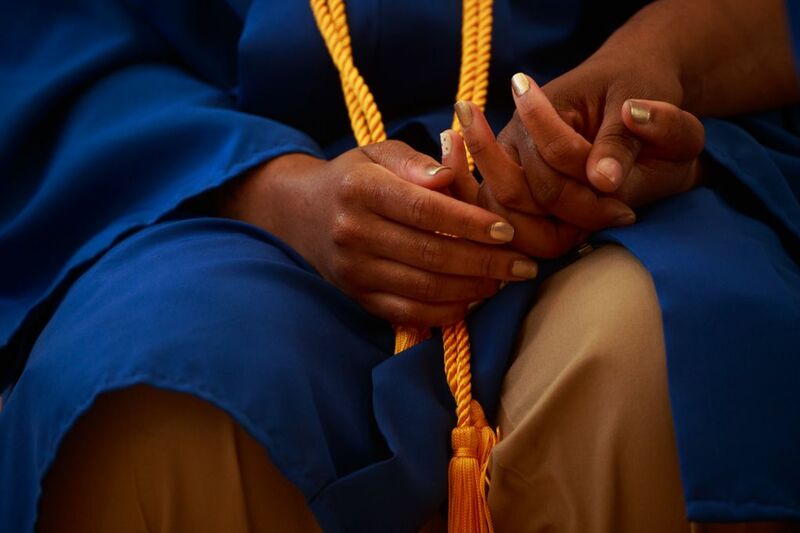 Many of the graduates hope to continue their educations, either in prison or out of it. Ginger Pratt, who will be released this fall, has sent her application to Washington State University Vancouver. Others, like graduate Marriam Oliver, are taking correspondence courses, another way to earn a bachelor’s degree while behind bars. Oliver hopes to one day have a Ph.D. behind her name. 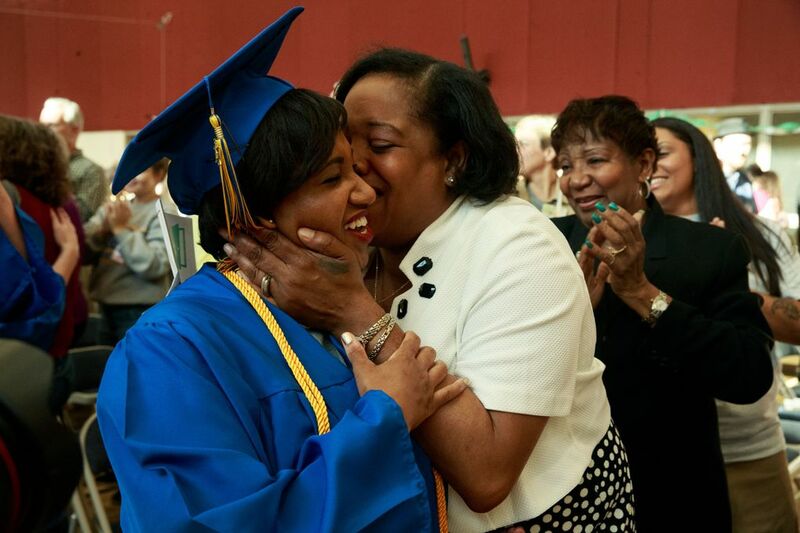 Anita Word was beaming with pride as she watched her granddaughter, Synae Mcmillon-Cooper, graduate. “We promised we’d be here when she got her associate degree,” she said. In recent years, some conservative politicians have joined in the call for criminal-justice reform that would do a better job of rehabilitating prisoners and lowering costs. Recently, the conservative political commentator George F. Will praised an education program in New York’s Sing Sing Correctional Facility, whose graduates are more likely to get jobs and less likely to return to crime after they are released. All 12 former Freedom Education students who have been released from prison are enrolled in college, Erzen said. She is working on a proposal that could allow the project to eventually offer a bachelor’s degree.